TORONTO, ON – August 9, 2018 – What are you waiting for? It’s time to embrace a life of style and fun, in the Toyota Corolla Hatchback. This Corolla – all-new for the 2019 model year – takes advantage of Toyota’s latest performance, handling, connected, and safety technologies, plus styling that grabs everyone’s attention. And, this hatch starts at just $20,980, that’s $1,770 less than the 2018 Corolla iM. “Corolla is an icon, and Canadians love hatchbacks, so what could be better than combining the two?” said Cyril Dimitris, Vice President, Toyota Canada Inc. “Drive it and discover the thrill of fun-to-drive performance that lives up to this hatchback’s striking design, plus advanced yet user-friendly technologies that keep you connected with the things that matter, no matter where life takes you." The newest addition to the Corolla family starts with an all-new way of thinking about automotive design. This is the first compact hatch to be conceived and built using the Toyota New Global Architecture (TNGA) – a platform that enables many desirable features. TNGA allowed designers to give Corolla Hatchback a low, wide stance to create a poised, athletic vehicle with a performance-enhancing low centre of gravity. The body is evocatively styled and exceptionally sporty, with a rear spoiler and standard features such as LED headlamps and rear combination lamps to impart a premium appearance. Get inside and even before the drive begins, the Corolla Hatchback engages the senses. For the cabin, designers adopted a modern concept of sensuous minimalism to create an interior that is simple, yet warm and inviting, with a premium look and feel. TNGA optimizes the seating positions even as it helps lower the vehicle’s centre of gravity. Under the hood, engineers created an all-new two-litre, four-cylinder Dynamic Force engine that gives Corolla Hatchback a competitive 168 peak horsepower plus excellent fuel efficiency. This spirited engine is paired with a choice of two all-new transmissions. On the automatic side, a Direct Shift CVT has 10 sequential shiftmatic speed steps, a sport mode, and available paddle shifters. It’s also the first passenger vehicle CVT in the world with a launch gear. This improves transmission efficiency and responsiveness in lower gear ratios. For drivers who prefer a manual gearbox, there’s an all-new six speed intelligent manual transmission with downshift rev-matching control to ensure smoother gear shifting. TNGA also improves the Corolla Hatchback’s dynamic performance. The body is a remarkable 60 percent more rigid than Toyota’s previous compact hatch offering. This maximizes handling and helps reduce noise and vibration. Meantime, suspensions have been carefully tuned to optimize ride comfort and stability, while the many design choices that have lowered the centre of gravity ensure the vehicle stays firmly planted on the road. Of course, the Corolla Hatchback wouldn’t be a Toyota without delivering impressive safety performance: Toyota is committed to making the road safer for all users and to lead the industry with innovative safety technology that’s available to all. To that end, the Corolla Hatchback is the first Toyota to be equipped with Toyota Safety Sense 2.0. This updated safety package adds new active-safety technologies and capabilities that enhance protection such as a Pre-Collision System that can detect a pedestrian under low light conditions or a bicyclist during daytime, a Lane Departure Alert able to detect the road’s edge and a new Lane Trace Assist (LTA) system that reduces driver burden and supports safe driving, especially in traffic congestion or long highway trips, when Dynamic Radar Cruise Control is engaged. This is a significant update to the bundle of active safety technologies Toyota introduced to Canadians in 2016, and which is now included as standard equipment on 95 percent of all new Toyota vehicles sold in the country. Toyota Safety Sense 2.0 joins the Star Safety System, a standard backup camera, seven air bags, electronic parking brake, and other technologies to help drivers avoid accidents or minimize their consequences. To express its upscale, sophisticated character, every 2019 Corolla Hatchback comes standard equipped with an impressive package of amenities. Easy-to-use technologies include Apple CarPlay and the Entune 3.0 Audio multimedia system, featuring the Entune App Suite and navigation provided by Scout GPS Link. These join an 8” Display Audio system with USB audio input and voice recognition, automatic air conditioning, push button start, and more. The 2019 Toyota Corolla Hatchback S is offered with a choice of the manual (starting MSRP: $20,980) or CVT (starting MSRP: $21,980) transmission. This model features power windows with up/down function on all windows, a 60/40 split fold-down rear seat, sport fabric seat material and 15” steel wheels. 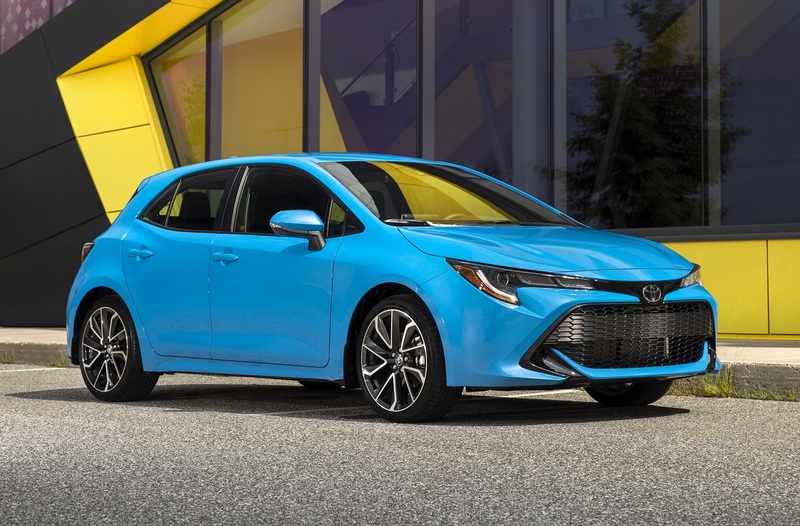 The 2019 Toyota Corolla Hatchback SE (starting MSRP: $22,580 manual, $23, 580 CVT) adds 16” alloy wheels, leather-wrapped steering wheel, heated front seats, an anti-theft system, unique badging, and more. CVT-equipped models also receive steering wheel-mounted paddle shifters. The 2019 Toyota Corolla Hatchback SE Upgrade (starting MSRP: $23,980 manual, $24,980 CVT) builds on the SE trim level with a heated steering wheel, 18” alloy wheels, the Blind Spot Monitor safety system, and the Qi wireless charging system for personal electronics. 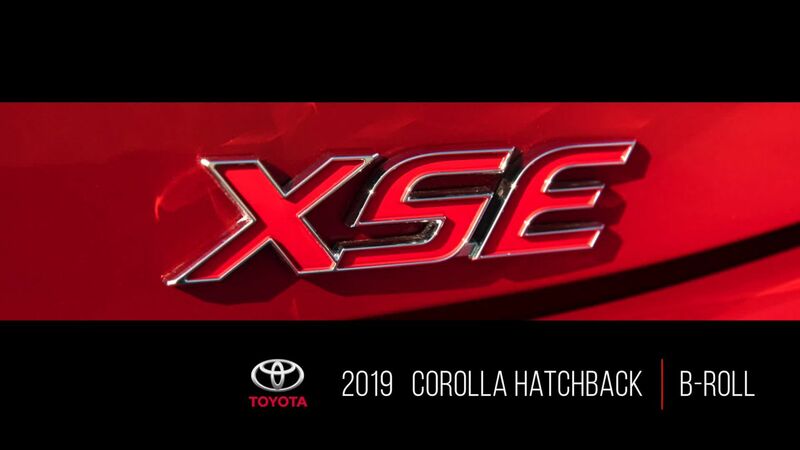 The 2019 Toyota Corolla Hatchback XSE (starting MSRP: $27,980 CVT only) starts with the SE Upgrade model, adding integrated Sirius XM Satellite Radio and the enhanced Entune 3.0 Premium Audio system with Safety Connect and embedded navigation. Other upgrades include dual auto air conditioning, sport fabric seating material with leatherette trim, an eight-way power adjustable driver’s seat, 7” multi-information display, and LED fog lamps. The all-new Corolla Hatchback can be enhanced by accessorizing to your personality and lifestyle. Accentuate the sporty nature of this hot hatch with an available Rear Spoiler accessory and record your adventures behind the wheel with the Toyota Genuine Dash Camera. Accessories like Roof Rack, START+ Remote Engine Starter and Block Heater will add to practicality and convenience, while available Body Side Mouldings, Hood Deflector and Cargo Liner will help protect the exterior and interior of your new Corolla Hatchback. The 2019 Toyota Corolla Hatchback goes on sale on August 15 at Toyota Dealers across Canada. For complete and up to date details and specifications, visit: https://www.toyota.ca/corollahatchback.